Cincinnati Milacron Sabre 500 CNC Vertical Machining Center s/n 7040-A00-93-0221 w/Acramatic 850SX Controls, 21-Station ATC, BT-40 Taper Spindle, 6000 RPM, Coolant. Conveyor, 1996 LNS Hydrobar mdl. 6.52HS-3.4 6-Tube Hydraulic Bar Feed. 2003 Akira-Seiki SL-20 CNC Turning Center s/n 03TC200-166 w/ Fanuc Series 0-T Controls, Tool Presetter, 10-Station Turret, Hydraulic Tailstock, Parts Catcher, 3J Collet Nose, Chip Conveyor, Coolant. 1998 Akira-Seiki ASL-30 CNC Turning Center s/n 98D074-042 w/ Fanuc Series 0-T Controls, Tool Presetter, 12-Station Turret, Hydraulic Tailstock, 8” 3-Jaw Power Chuck, 5C Collet Nose, Coolant. Okuma Cadet Type LCN8 CNC Turning Center s/n D382 w/ Okuma OSP5020L Controls, 12-Station Turret, Hydraulic Tailstock, Parts Catcher, 10” 3-Jaw Power Chuck, 3J Collet Nose, Chip Conveyor, 1995 SMW Type M04.6 Omnibar Bar feed. Miyano BNC-35 CNC Turning Center s/n JN35039 w/ Fanuc System 3T Controls, 8-Station Turret, Hydraulic Tailstock, 6 ½” 3-Jaw Power Chuck, Coolant. 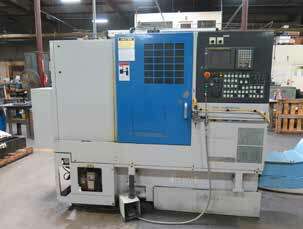 Wasino LG-60 CNC Cross Slide Lathe s/n 358 w/ Fanuc System 3T Controls, 5C Collet Nose, Coolant. Ikegai TC26K CNC Cross Slide Lathe s/n 54235V w/ Fanuc Series 18i-T Control s, 5C Collet Nose, 16 ½” x 25” Cross Slide Table, Chip Conveyor, Coolant. Conomatic Size 3 ½ mdl. SF 3 ½” Cap 6-Turret Automatic Screw Machine s/n 11237 w/ 6-Cross Slides.Conomatic Size 3 ½ mdl. SF 3 ½” Cap 6-Turret Automatic Screw Machine s/n 6348 w/6-Cross Slides. Wickman 2 ¼” x 6 6-Turret Automatic Screw Machine s/n 30064 w/ 6-Cross Slides, Chip Auger, Porting and Reaming attachments.Wickman 1 ¾” x 6 6-Turret Automatic Screw Machine s/n NA w/ 6-Cross Slides, Chip Auger, Reaming Attachment. Conomatic 1 5/8” x 8 8-Turret Automatic Screw Machine s/n 4113VB w/ 6-Cross Slides, Coolant. Wickman 1 3/8” x 6 6-Turret Automatic Screw Machine s/n 680211 w/ 13” Feed, 6-Cross Slides, Pick-Off and Thread Rolling Attachments. Wickman 1 3/8” x 6 6-Turret Automatic Screw Machine s/n 620153 w/ 6-Cross Slides, Pick-Off and Geometric Die Head Attachments. Wickman 5/8” x 6 6-Turret Automatic Screw Machine s/n NA w/ 6-Cross Slides, Tapping Attachment, Chip Auger. Wickman 5/8” x 6 6-Turret Automatic Screw Machine s/n 660820 w/ 6-Cross Slides, Pick-Off Attachment, Chip Auger. Wickman Attachments : Thread Rolling Heads, Slotting Head, High Speed Drilling, Reaming and Tapping Heads. Conomatic 9/16” x 6 6-Turret Automatic Screw Machine s/n 11832QE w/ 6-Cross Slides, Pick-Off Attachment. Conomatic 9/16” x 6 6-Turret Automatic Screw Machine s/n 10554QE w/ 6-Cross Slides, Pick-Off Attachment, Chip Auger. Conomatic 9/16” x 6 6-Turret Automatic Screw Machine s/n 8677TK w/ 6-Cross Slides, Pick-Off Attachment. 1979 Traub mdl. TB60 Automatic Screw Machine s/n 5953 w/ 4-Cross Slides, 6-Station Turret, Bar Feed. Traub mdl. A42 Automatic Screw Machine s/n 19110 w/ 4-Cross Slides, Drilling Station, Lipe mdl. 87-AML Auto Bar Feed Magazine Loader s/n 10823. Traub mdl. A42 Automatic Screw Machine s/n 2835 w/ 4-Cross Slides, Drilling Station, Lipe mdl. 100-AML Auto Bar Feed Magazine Loader s/n 12859. Traub mdl. A42 Automatic Screw Machine s/n 1833 w/ 4-Cross Slides, Drilling Station, Lipe mdl. 87-AML Auto Bar Feed Magazine Loader s/n 10653. Traub mdl. A42 Automatic Screw Machine s/n 1528 w/ 4-Cross Slides, Drilling Station, Lipe mdl. 87-AML Auto Bar Feed Magazine Loader s/n 13182. Traub mdl. A42 Automatic Screw Machine s/n 2837 w/ 4-Cross Slides, Drill Station, Bar Feed. Traub mdl. A42 Automatic Screw Machine s/n 2828 w/ 4-Cross Slides, Drill Station, Bar Feed.